Heaven’s Baseman have split with frontman Aaron Buchanan, and they’ve brought in We Are Harlot’s Danny Worsnip as a stand-in for their upcoming shows. 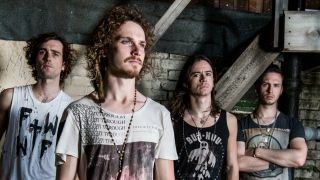 The band report that the lineup change is amicable, and Worsnop’s temporary position gives them time to recruit the perfect full-time replacement. Buchanan joined the band in 2011 after the departure of Richie Hevanz, and appeared on 2012 debut album* Filthy Empire*. Heaven’s Basement say: “We’ve all had a fantastic few years but we simply feel that our time together has run its course. Buchanan adds: “The break between the band and myself is quite amicable and simple – we are going in different directions.